and have 2 tangerine clowns, a blood shrimp, a Royal grammar, 5 turbo snails, and a coral beauty angelfish. My coral beauty look like it has a spot on it's head well not a spot more like a cut as it does nip at the rock (couldn't snap a photo as he is too quick) is this common no other fish have any marks? I also added a sand sifting star fish yesterday. When I added him it was fine had a move about then butties itself, this morning it's had a move about and I can see all the flesh of one leg has gone, a few hours later it's leg has all gone green? Did I do something wrong? What do I do? Should I take it out? I am completely panicking thinking I must have done something wrong and that it will effect my other fish. I have attached so photos so that you can see. I hope you can help or give me some advice I have search everywhere online but there's no actual advice on what to do. But again thank you for your response. I have a sand sifting star in my 210 gallon reef with roughly a 4� sand bed, some places it's ½� other places it's 6�+, engineer gobies are busy little excavators. I've had it for a couple years now, a year and a half ago I came home from work to a 210 gallon that sprang a leak and was empty, a couple days after that event I started to scoop all the sand out and found my sand sifting star, I thought it was dead and pulled it out and laid it on it's back, while scooping I noticed it's little tentacles on the legs moving so I grabbed him and put him in the tank I set up for the few surviving fish. To my amazement it lived and has been doing great, until recently, a month or so ago noticed little notches missing out of it's legs, I kept an eye on it not sure what to do, the notches didn't appear to change in size and I didn't notice additional ones appearing, then about I week ago I found it curled up with all it's legs off. I thought it was dying but left it in to watch, the next morning it was gone, I figured it died. I just saw it tonight, still alive. I've embedded and attached a picture, hopefully one will load. Can it come back from this? Can I do anything to help it? Both pairs of dragonets spawn which I think is really neat. I did raise the temperature of the tank from 77* to 80* when I noticed the ick. The starfish had already lost his legs at this point. I do 30 gallon water change twice monthly with RO water. I'm embarrassed to say that I do not dose the tank. I have Reef complete, Reef carbonate, and Reef Plus but I always forget to dose it. When I do remember to dose it I do 9 capfuls every 3-4 days only dosing one at a time, I pour it into the refugium. I did not test magnesium, the top on one of the bottles wasn't on properly and it leaked out. I seem to recall reading about treating with antibiotics, but haven't a clue on what I actually use or how or if its recommended in this case, or do I leave it alone and hope for the best? Hello Crew, Thank you for sharing your knowledge some of we saltwater beginners. I am extremely green to the saltwater world. 2 weeks ago I purchased a Sand Sifting Sea Star. My tank is a 50 gal. octagonal shaped. I do not have sand or live rock yet. At this time I basic rock at the bottom. 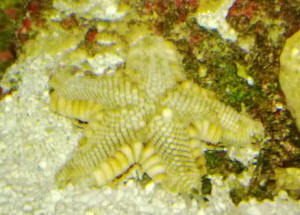 This Star shares a tank with 2 clown fish, 3 tiny damsels, 1 peppermint shrimp & 1 Lawnmower Blenny. They look pretty content no excitement or trying to hide going on. I noticed the Sea Star is losing the spines/teeth that run/outline around it's legs. Thank you so much for your input. The owner at the fish store suggested I purchase this type of Star, and I had told him exactly what my tank setup was. Being green, of course I'm going to believe him. At this time I drop 2 small cubes of defrosted brine for the SSStar. I do this when the tank is dark so that most of the brine will make it to the bottom before the other fish get to it. Would it be best to use a different feeding method and add another type of food for the Star? Sara m. - I do appreciate the reply but could do without your rudeness. for your information, my husband has had a salt water fish tank for 20 years now and more than likely is more informed than you are. this was an unusual circumstance with a new purchase and something we had never seen before... we were looking for guidance, not sarcasm. thanks for nothing. <I was not at all sarcastic, simply frank (as I'm again being here). Sand-Sifting Starfish Disintegration 10/10/05 Ok, here is my second of two questions. I asked about the Bristleworms yesterday. Thanks, that was super helpful. <Welcome.> You guys truly rule. 55 gal ~100lb of live rock pH: 8.2 at night, varies by <.2/day Ammonia: 0 ppm Nitrite: 0 ppm Nitrate ~0 ppm (might be /slightly/ higher than 0ppm, but less than .05, I'm partially color blind, so it's tough to tell sometimes) Calcium: 400ppm Temp is about 79-80 degrees (I know a little warm, but it gets really hot under my lights during the summer, and I can't afford to keep the house at 70 degrees to cool it off) Specific Gravity: 1.020 Lighting: AquaClear 300 light strip with (2) "10,00k 65w Daylight," (2) "True Actinic 03 Blue Lights" and (4) blue LED moonlights The tank is 24" high. (mechanical) Filtration: (1) AquaClear 300, (1) Fluval 204 (which I think I shouldn't have purchased after reading your website) and (1) CPR "BakPak" protein skimmer thingie (I'm going to lose the AquaClear and Fluval, per your advice in previous email) <Good idea.> I have read over your website, and I haven't really seen too many postings about Sandsifter Star disintegration. <Echinoderms, especially Stars, do tend to be prone to disintegration due to bacterial infections or possibly starvation. Likely the issue here> Most of the starfish questions are Bristle Stars...which I am morally opposed to since one ate my favorite Peppermint Shrimp last year... <Brittle Stars are a diverse bunch... Some, especially the Green ones, are active hunters. Most others, in my experience, are fine, notably the plain brown ones. Big ones are generally a bad idea, though.> Anyway, I came home last night and my Sandsifter Star was sort of holed in a corner of the tank, and to my horror its skin/scales were falling off of it. It was just disintegrating. It was fairly obvious that it was in the dying process, so I attached some pictures of it after I pulled it out of the tank. <Again, cannot view pics. Luckily this problem is common enough that it does not need any.> It looked like its skin was just falling off of these dark green things inside the legs. I'm guessing the green things were the Star's nervous or skeletal-type system (they tracked what would be its spine/femurs if it had such bones). <Yep, more or less.> The Star had been in this tank for about 9mo w/no problems. <Getting enough food? Sand-sifting stars need a lot to function, and most sandbeds simply don't contain enough biodiversity to sustain them for an extended period of time.> I am a tax attorney, so forgive me for not knowing the anatomy non-spine type creatures. <You have my forgiveness.> Anyway, I was pulling the live rocks out of the tank the night before because my Tang got Ich, and the Goby (the only other fish in my display tank) wouldn't come out of the rocks to let me move him to the quarantine tank. <Welcome to the world of fishkeeping.> Well, so you know how cloudy the water gets when you start taking live rocks out, so during this process I looked down and it looked like one of the rocks had fallen on the head/center part of the Sandsifter Star. <Could very well have led to a bacterial infection, then disintegration.> That was almost exactly 24 hours before he (it?) started disintegrating. I confirmed from your website that stars don't get Ich, so I assume it was the fallen rock that killed my star? <Indirectly, yes. The rock cut/bruised the star, opening it up to bacterial infection.> I assume it was the rock, but if there could be something else, I would like to know that before I start working on putting corals/anemones back in the tank. I guess the green tentacle-type things inside its body were what concerned me. The green things were wriggling around independently of the star, so I was afraid this could have been some sort of parasite or something. <As far as I know, there are no such parasites.> More likely it was a part of the Star that was just in a lot of pain. So sad... Rusty, Columbus, Ohio <Indeed. Unfortunately, odds are good that the star is already long gone once it begins to disintegrate. Best, Mike G> <<Please note: these invertebrates do not have the type of nervous system that would "allow" them to feel pain as we higher order vertebrates would/do. 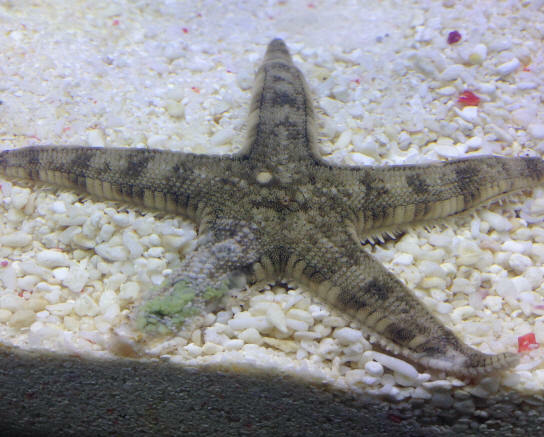 Also, seastars can be treated for bacterial issues, often effectively, if they are separated and treated early on. Google "Marina, Spectrogram, starfish/seastar" on WWM. Hit the "cached"